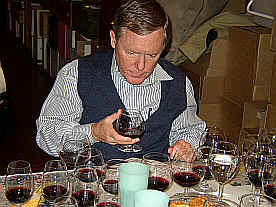 The California 1994 Cabernet vintage was quite highly regarded, the crop level being managed by Mother Nature in the form of a rain storm in spring. With reduced crop levels, the vines progressed at a rather modest pace as the summer was mild but not hugely hot. There was a bit of rain in the early fall, but not enough to harm the fairly sturdy Cabernet Sauvignon. Most winemakers were happy with the fruit they had to work with, the grapes having intensity and potentially good balance. The results of this tasting are remarkable in that one wine had 50% of the first place votes yet it did not win the tasting! One wine was clearly a loser, either the wine being poor or the bottle having been flawed. Here was simply a bad bottle of wine. Not having much experience with this vintage of this winery, it is difficult to know if this was a representative sample. One taster described it as "Short, nasty and brutish." Another wondered if there wasn't something wrong with the bottle, such as being corked. The panel members said it was not corked, with one adding "that would have been an improvement!" Another person said the wine was maderized or oxidized. I described the wine as being "tarry" on the nose with a character more reminiscent of really old Barolo more than ten year old Napa Cabernet. Sad. One critic pegged this as having a "barn-yardy nose and an earthy edge with some meaty, leathery and burnt ash notes." Another felt it was "worse on the nose than on the palate." Other adjectives included "almonds," "herbaceous" and "faded." 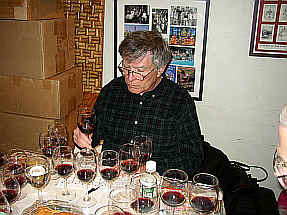 A final word from one critic was "this would be more at home in a tasting of Merlot wines, but it's outclassed here." I can understand the sentiment of the wine being more Merlot-like than Cabernet. It displayed a jammy, stewed plum character and is a rather ordinary bottle of old red wine at this stage. Not much to like here. A few tasters had kind words to describe this wine, one finding it to be "hearty, youthful, tart and displaying wild berry and tart cherry fruit with some dill-tinged oak notes." 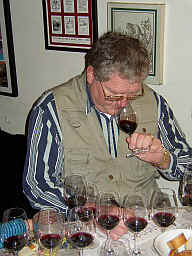 Another person found "raisin spice and cigar box tones with nice fruit making for an harmonious wine." A third critic said the fruit was "very ripe," while another detected "sour cherry notes and it's tart and bitter being very simple." A fifth panel member said it is "very bitter," while a final taster said it's "volatile." I was pleasantly surprised by this wine, not being much of a fan of Guenoc or the Beckstoffer vineyard wines. It showed some dark fruit notes with a hint of blueberry cobbler fragrances. It is still youthful with a bit of tannin. The wine is not terribly complex, though, but it's a pleasant enough Cabernet. I gave it a one star rating on my three star scale, zero stars being a standard quality wine and three being a hall of fame candidate. One panel member felt this was had "faded and was faintly raisiny. It's rather flat and has not future." Someone else found it to be a "jammy, fruit forward wine with a fair amount of nicely integrated oak, black cherry fruit and white pepper spice." A third perspective found a "tightly wound wine with meaty notes, smoky oak along with leathery, currant fruit, tobacco and sweet vanillin oak." Another panel member likened this to an "Aussie Shiraz," while another critic found some "earthy, green pepper notes." I described it as dusty and berryish with some lovely woodsy tones. It's nicely oaked and I enjoyed the lightly herbal quality. 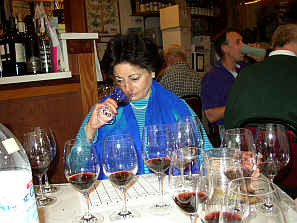 On the palate the wine is rounded, with supple tannins and dark fruit flavors. I gave it a one-and-a-half star rating. "This is a monster!" 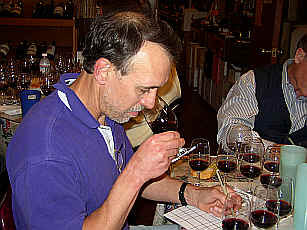 said one taster, adding "It has notes of charcoal and is very youthful...it can go ten more years!" 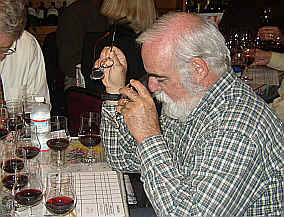 Another participant found it to have "bitter, mouth-drying tannins with some sweet oak...they probably should have fined this to drop some of the astringency." One taster said it's "ripe, rich and shows some plum fruit and forest floor notes...there's also a vanilla spice quality to this astringent Cabernet." A final critic found it "excessively oaky." I detected some dark fruit aromas and a hint of mint on the nose. There's a loamy note, too, with some woodsy fragrances. It is one of the more tannic wines we tasted, but this has been a hallmark of Dalla Valle wines. These tend to be almost brutally tannic and fierce in their youth. I was glad to see signs the wine might actually have a future. One-and-a-half stars. Our lone Washington State entry, one person noted this as a "different" wine, finding it to have a "wonderful floral nose and a velvety texture. There's spice pear and plum notes to this complex and wonderfully balanced wine." A second critic found it to be "plushly textured with juicy notes and vanilla-infused blackberry fruit along with smoky plums and a lovely, berryish finish." But someone else felt it was "over-ripe and pruney, not plummy." A fourth critic said it was reminiscent of "mint juleps with so much oak!" I found a dusty note to this woodsy Cabernet, but what I interpreted as a metallic quality was what caused me to rank this as low as I did. It's mildly tannic on the palate and has some pencil shaving tones, but the metallic character was bothersome. One star. "This is a well-crafted, slightly bitter wine with unripe black plums, dusty sage notes and some currant-like fruit." said our lead-off batter. Another taster found it to be "a bit hot and having black cherry fruit." A third person found "blueberry, cherry and coffee notes...this is a great wine!" Someone else said it shows "wonderful perfume with sweet cassis-like fruit, a hint of coffee and a cola note. It's very nice to drink now, too!" Agreeing with that sentiment was a fifth critic who pronounced this as having "great balance." One detractor said it was low in acidity and "is a little unfocussed." I really enjoyed this wine, finding a mild cassis aroma with some good, woodsy notes. There's lots of dark, sweet plum fruit on the palate with a hint of mint. It's moderately tannic, but so nicely packed with fruit, the balance is very fine. I felt it can go another 5-10 years and gave it a two star rating. 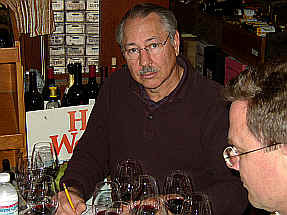 "Here's an immense, thick, almost chocolaty Cabernet with black cherry fruit and some smoky blackberry notes." Another fan described it as "toasty and cherryish with a lot of life and tannin." One person found it to be "big, powerful, intense and it keeps on coming." 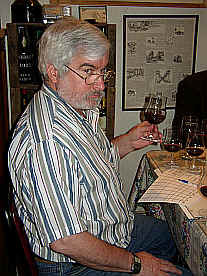 Another panel member found it to show "lots of cassis and blackberries with a really long finish." I noted a lot of black fruit on the nose with some cedary, oak fragrances. It's fairly tannic and mildly leathery on the palate, but with plenty of fruit. Very fine. Two stars.